Tropical Fish Keeping - Aquarium fish care and resources > Freshwater Fish and Aquariums > Freshwater and Tropical Fish > Livebearers > How soon until my Molly gives birth? How soon until my Molly gives birth? She's been getting bigger and bigger. About two weeks ago I was thinking she was going to have her babies within the next day or two, but clearly I was wrong. Here's a picture of her from tonight. Any idea when she'll give birth? Haha...she looks like she's at full term by now and should go any day now. However, keep in mind that livebearers can hold. She will do so if stressed(like say you put her in a breeder or an uncycled or over-crowded tank...) and if stressed may abort or reabsorb and not give birth. Livebearers can pause pregnancy for weeks to months if they so desire, they can also grow multiple broods at once and instead of giving birth every 28-32 days can do so twice in that time period(in very rare occasions they can have even more births in a months since they can have multiple broods growing). They can also mate ONCE and hold sperm for up to a year without having babies, or they can use that stored sperm to fertilize their eggs monthly for several months if they so desire. If you let her be and don't move her around, have her in a nice calm tank where she feels secure, and where there's enough room(mollies need 25-30 or more gallons to live properly and be happy and need to be kept in groups of no less than four, five or more is better)...she should pop soon. What a pretty little Dalmatian. =) If you get some thick stem plants, like guppy grass, java moss and the like, the babies will have an easier time hiding and surviving, but do expect many casualties if you keep them all int he same tank, no matter how dense the planting...she looks like she'll have at least 50 babies, maybe more. Depends how big the kids are, and how much of that is actually from babies and not being a well fed fish. And also if she's carrying a second or third brood along with the ones about to be let out. Last edited by Sylverclaws; 01-12-2014 at 05:54 AM. Any time now. When they get a square chest you are typically within 120 hours. Thanks for the responses. Unfortunately I just came home from work to find her dead at the bottom of the tank and some of my guppies picking at her. She didn't look like she had given birth yet. She was still huge. Any idea what may have happened or how I can prevent it from happening again? It's possible a baby got stuck in the birth canal and rotted, poisoning her. Unfortunately that happens sometimes. Stress could have caused it if she was bothered by other fish or if it was very noisy and active in the area around the tank....she could have caught a nasty...for pregnant fish that are about to drop, it's usually a baby that got stuck, and there's really not much you can do about it, especially if you can't see the baby. Same thing if she got stressed from a move or some such and tried to reabsorb a near full-term brood, they risk rotting and poisoning the fish as its body tries to absorb them. I'm sorry to hear about that happening. =( I lost a couple fish that way as well. Sounds like that could have been the case. I haven't moved her since I brought her home, and I refuse to use breeder nets for pregnant fish (though I do occasionally use them for fry that I catch around the tank). It's a very peaceful tank (guppies, mollies, swords, neon tetras, kuhli loaches, and snails), and for the most part they all left her alone, so I don't think that she was being harassed. It's such a bummer that nothing could have been done. I wish I could have at least learned something from this to prevent it from happening again. The only thing you can really do for pregnant fish, is keep them as calm as possible and keep the tank nice and clean...of course that's good for any fish! lol Mollies also prefer a bit of salt in their water, and that could help for future reference...but not with your Kuhli's! I actually do use a tiny bit of aquarium salt, and the kuhli's tolerate it very well. I'm only using one tbsp for every 10 gallons though. 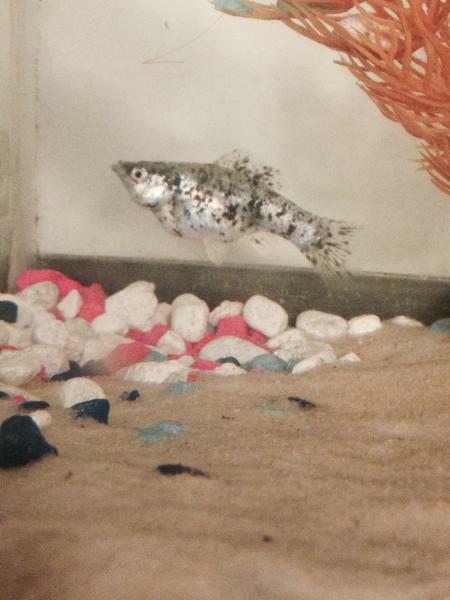 I hate the idea of moving pregnant fish, but would it be benefit my livebearers to go into a separate breeding tank a few days before the give birth? I've also considered tank dividers, but I really don't like the idea of cutting the rest of the fish off from part of the tank unless I have to. Sorry you lost your fish. I've been seeing a lot of posts like this where a live bearer blows up like she's going to drop, then suddenly dies with no noticable warning. Could be complications with birthing but I never had any problems when I kept livebearers . You are a little overstocked but not terribly, might be a little crowded for a mom trying to give birth...and maybe the additional stress from your other fish messed things up. Personaly I would move the molly mom to another tank as soon as she shows that she is pregnant. Mollies are weird . They like salty water and need a more plant-based diet than most livebearers. If you have the room and the desire to do so , I would reccommend a second tank just for your mollies. Then you could increase salt nearer to 1 tablespoon to 1 teaspoon per gallon. But I did notice a few other things that can cause stress. You're only a tad over-stocked provided the tank is well maintained and planted, otherwise you're a tad more than over-stocked on both space and bioload. You only have two swordtails and two mollies...swordtails CAN get along with only 3 members, but less is just not happy for them. They prefer larger groups of 4-5+, as do mollies. Being without a sufficient group(though they're not really SCHOOLERS they do need a group), can cause some massive stress. Worse if you have more male guppies and if the second molly is a male...they will constantly pester her to mate and that can cause problems. If you can...I'd suggest you get a 55+ gallon tank and set it up nice, move your fish over there a group at a time or so, that way you wont cause spikes in acidity and such or stress the fish too much. And once that is done, buy proper groups for your fish. Kuhli's also prefer larger groups too, and they have a very low bioload. You could get a few more in a larger tank, they're quite happy with more room! You can use the 30 gallon as a nursery or a birthing tank for your females where they will not be pestered and can feel secure. Very dense planting in there could make it useful as both a nursery and a birthing tank with much less risk to the babies while mom is in there, or divide it(which is better) so you can move mom a week or more before she's ready to give birth, less stress towards the end is best.